Imagine being unable to perceive or process anything on one half of your world. A lesion of the right parietal lobe may result in a syndrome of spatial neglect. People with such a syndrome are unaware of objects or information in the left half of their world. The clock-drawing task is a commonly used test of cognitive function. 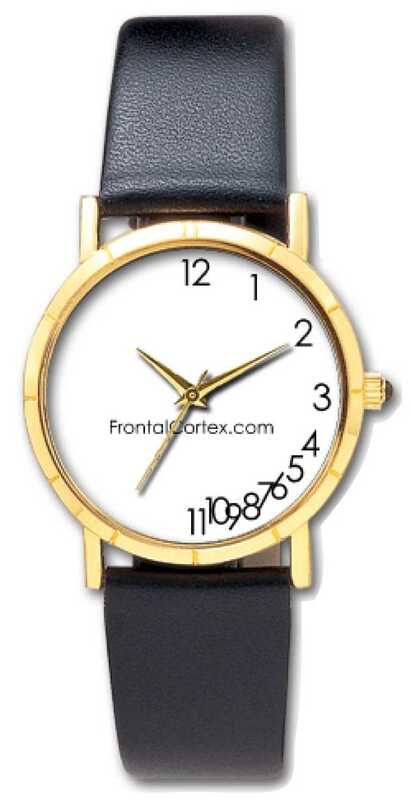 This watch shows the classic finding of a clock drawn with all the numbers on the right side of the face, which is indicative of a left-sided neglect syndrome and highly suggestive of a right parietal lesion. The watch is intended as an educational illustration of an important and well-recognized icon in neurology. It is useful for explaining the clock-drawing task and spatial neglect, and makes a fascinating conversation piece. The Parietal Watch may be purchased from FrontalCortex.com for $25 (US) plus shipping and handling costs. Shipping is $5 within the USA, and $8 outside of the USA. Shipping time will vary based on your location.